Many mid-level software firms and financial institutions have seen two of the worst crisis in the past decade: dotcom crisis and sub-mortgage crisis. Before the crisis, people were so optimistic that big long term project plans were prepared packaging in as much features as possible, running up to 3-4 years. Interest rates were affordably low, and market dynamics was such that there was huge demand for each and every product and service. Extravagant meetings were held at plush hotels, everyone got a big pay check and everyone was provided a smart phone with immediate access to emails. Also, what happened was that people went overboard on ensuring that we were compliant with a formal project management to ensure process compliance with project management templates. SEPG and similar groups mushroomed who were dedicated towards implementing processes at any cost, even if process overhead reduced project benefits, as focus was on long term goals. Project managers worked in silos without any direct correlation with the business team. They were located in PMO, which were in many scenarios not in the physical vicinity of the business teams. the project managers to coordinate directly with the business teams so they could be closer to the customers. Also, the focus shifted from mega benefits 3 years down the line to immediate customer priorities. 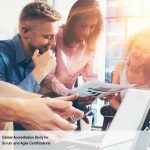 The aim was to provide customers exceptional value consistently, by capturing their requirements sprint by sprint and taking constant feedback. This shows that in times of crises, transitioning to an Agile mind-set helps a company survive. It helps to cut costs drastically by reducing inefficiency and redundancy. It helps retain customers by providing exceptional value to them, which helps thwart competition. Agile also improves working relationship among all the team members, as it promotes collaboration and flat structure. Agile creates a sense of urgency that is essential to save a sinking ship. 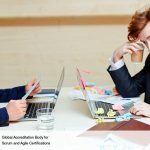 Many companies who could not pursue the Agile mentality had to unfortunately shut down, and those who survived realized the importance and value of transitioning into an Agile mind-set so as to avoid / manage similar crises better next time. 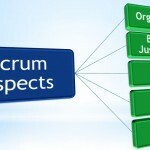 Scrum and Agile: How different are they?